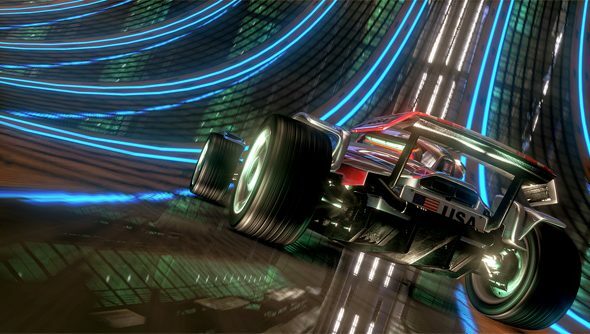 Five years down the road, the name TrackMania United Forever rings false: Nadeo’s series has never been so divisive. 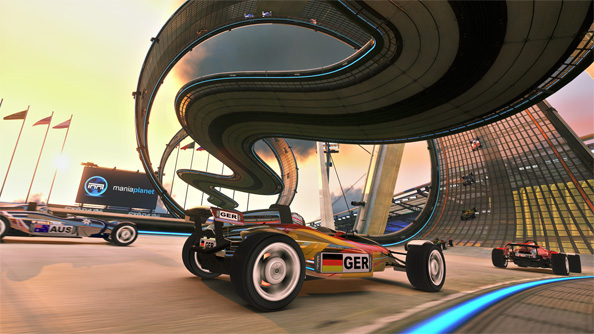 TrackMania 2: Stadium, an untimely flashback to e-sports phenom TrackMania Nations, has caused all kinds of political ructions. What did you expect? As player base goes, TrackMania made an island of itself with TrackMania 2, a game so full of weird and forbidding customs that only the dogmatic tribesmen of its community would even bother to understand it. That a lot of those players arrived via Nations, which cost £0 in 2006, explains much of the resentment towards this £7.99 remake. Many still play and build in the old TrackMania Stadium, so what’s new enough about this one to not rip the player base in half? Well, a new singleplayer campaign of really very good tracks, for starters, the work of StarTrack winner and now Nadeo wunderkind PapyChampy. There are flashes of inspiration in even the earliest of them, the ManiaPlanet lighting engine adding shadow to the mapmaker’s toolbox. The tracks leer at this old environment made young again, exploding into some real marvels of block design as you unlock the final tier. Make no mistake, this is a gorgeous update to somewhere so familiar. Up in the rafters of those ridiculous hangars you’ll see the last bounces of light on the textures where before it was simply flat. The concrete diffuses daylight in ways that make those looming decorative ramps seem all the more believable, and thus incredible. The cars are like mirrors now, as if to compete with all the gleaming pillars of steel and neon. Even the dust on the camera lens shines golden. Tech this old has try hard in this day and age, and it does. So far, then, so instantly controversial. No, you can’t just turn the shadows off like you could in the old days, and yes, sometimes the art obscures the gameplay. The cars are often too bright and the tunnels (more on those in a minute) too dark. Ask yourself, then: is that a problem or a challenge? Bug or feature? Just what kind of Trackmaniac are you? Is there any other than the eternal optimist who learns to love Nadeo’s decisions even when they’re quite, quite mad? I don’t know precisely why, for instance, Nadeo chose to split these TM2 environments into title packs you have to load separately, each appearing as a near fullscreen icon upon startup and not easily merged into multi-environment servers. I’m not even sure I’ve seen one of those, in fact. And while the official Wiki has greatly improved upon the disastrous lack of documentation at launch, the game’s UI is still bonkers. Perhaps that’s because TrackMania is gaming’s ultimate fixer-upper and wants to encourage modding by being a bit knackered. Right? That’s what I want to believe, anyway, but cripes it’s hard. The ManiaPlanet UI is such a tumbledown affair that when you click an icon too hard you half expect it to fall off. And lurid, too. If the ‘Compuserve chic’ of the giant bevelled buttons was any greater there’d be pixellated snow falling behind them. Hover over one and it’s like something out of Tron. Where this sits on the Web 2.x spectrum I have no idea. I’m not being facetious, by the way, because ManiaPlanet’s status as a user-generated content pioneer isn’t nearly so assumed as it was five years ago. This stuff is important. Being able to play, create and share is such a standard concept now that even consoles are moving on, and TM2 struggles to reassert itself with processes so confusing. But then that’s also its charm, isn’t it, so what’s Nadeo to do? If I could fix it all with just the touch of a button, make everything work like all the other games, I’d hesitate. 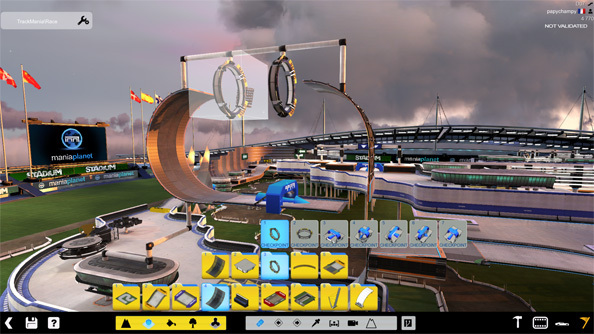 TM2: Stadium’s track editor, then. Largely unchanged since Canyon and still absolute crack to play with, it benefits from several new blocks which most notably involve tunnels. Tunnels! It’s logical when you consider how Canyon used them to really spice up the game’s palette, plunging you into dark mountains and then BOOM, into the light. It happens again here as you loop track 90 degrees upward from twenty feet underground, over an upside-down jump and back into the Earth. The downside is that, unusually for Stadium, you often run into limits of these blocks just as the rollercoaster designer in you gets going. What happens underground is much less entertaining than on top, more of an aesthetic event, and the same goes for transitions between them. How much of this is effectively hard-coded into the existing block set is for future updates to clarify. There’s also a little less flight to the new Stadium car despite assurances that it’s the handling you all know and love. It’s closer to Nations than Canyon, yes, but not without weight. That throaty new TM2 engine noise brings certain expectations of the game’s physics, and there’s a lingering feeling that the cursor keys aren’t quite up to the job. None of which makes the game any less infectious to all but the fiercest designer or competitor. Time will tell how manic these tracks can get. While it is possible to batch convert the old ones, there’s the odd unwanted side-effect (lighting and camera mostly) and password-protected tracks are off-limits.